120/220 VAC switchable power input. Fully automatic and microprocessor-controlled, senses state of charge and protects against over-charge. 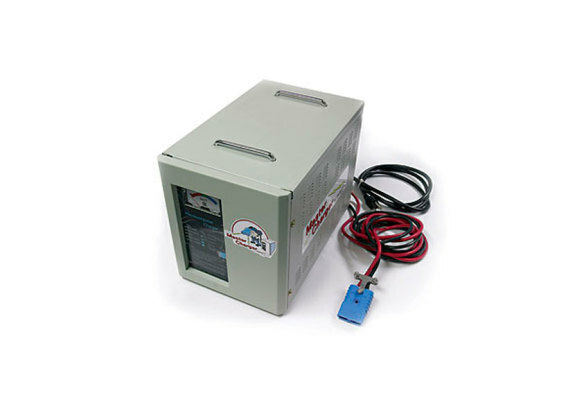 This master charger has numerous built-in safety features including one that prevents the unit from turning on unless voltage is present at the charge lead (min 2volt) and the lead polarity is correct. The charger is fully automatic and utilizes “average” and “float” functions to sense the state of charge of the battery to guard against over-charge, while also boasting a “protect” setting. The transformer uses a temperature fuse to protect the unit against overheating, and the DC output also has a fuse.